I recently listened to an interview with DeeDee Doke of Recruiter.co.uk in which she related to Amybeth Hale that the perception in the U.K. is that sourcing is an entry level career in the recruiting industry. Apparently, using information systems for talent discovery and identification is perceived by many as a junior role and skill across the pond. I’m saddened by this, and what makes it worse is that this sentiment isn’t limited to the U.K. – there are plenty of people in the U.S. as well as the rest of the world who feel the same way. This perception most likely comes primarily from the fact that many people don’t really yet understand, appreciate or know how to fully leverage the latent power of human capital data. Yes, there is deep latent power hiding in data of all forms – all you need to do is take a look at business intelligence solutions and how much money companies spend on them (millions) to get a basic appreciation of the power of data. Unfortunately, it doesn’t seem that many companies value human capital data in the same manner that they value their sales, product and customer data. What is Human Capital Data? I define human capital data as any information, typically text-based, that can be used as a basis for gaining insight into what kind of contribution a person could be capable of making to an organization. Of course, the most familiar source of human capital data is the resume. With resumes having been around for quite some time, there are those who feel resumes are dead (they’re not, nor will they ever die – they will just evolve). Regardless of how they change or what you may eventually call them in the future, there will always be a need for a searchable summary of a person’s experience and accomplishments. Personally, I love resumes. They are deep sources of human capital data – information that can be analyzed to enable me to gain predictive insight into a person’s capabilities based on what they have been paid by others to do in the past. In addition to resumes, social networking sites such as LinkedIn, Twitter and Facebook can be excellent sources of human capital data, in addition to the Internet itself, with blogs, press releases and various treasures just waiting to be found. Today, sourcers, recruiters and companies have more access to more human capital data than ever. 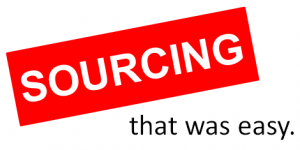 Could this very fact perpetuate the perception that sourcing is a junior role, simply because resumes, social networking profiles and Internet content is so easily accessible? I definitely think so, but it’s based on faulty logic. Accessing human capital data is the easy part. Every search “works.” Anyone can type in a title and a couple of keywords into LinkedIn, Monster, their ATS or the Internet and get results. In fact, it’s so easy you can outsource it for $5/hour. Heck – even a an intern with no experience can do it! Getting some results from searches has never been the challenge – it’s always been easy. What most people fail to grasp is that finding some results is not the same as finding the best results. Sure, your query pulled up some people who have the right title and seem to have the right experience, but have you ever wondered if the ones you found are the best people available to be found in the source you’re searching? That is what we’re trying to do, right – find and hire the best people that can be found? Feeling good about searching for a title and some keywords and getting some results is like feeling good about hitting a golf ball. If you don’t care about precisely where the ball goes, simply making contact with the ball and making it go somewhere feels like an accomplishment. However, some people are capable of not only hitting the ball, but making it go farther than most and exactly where they want to go. Holes-in-one are actually possible. Professional golfers know this and are constantly working on being able to get the ball in the cup with the least number of strokes possible – they are not happy just to hit the ball around. They also get paid quite a bit of money – because they get the best results. One of the challenges associated with understanding the latent potential of human capital data is that there is no known target to aim for. Golfers have the advantage of knowing where their target is – it already exists on the green. The problem with sourcing is that the best candidates are not already identified, and each one can look completely different – there is no predefined target resume that is automatically indicative of top talent. Some of the best candidates have unimpressive resumes that leave you with little clue as to their true potential, let alone what they have already accomplished for other employers. Except for the most complete and detailed LinkedIn profiles, social network data gives you a much less predictive sense of the true capabilities of the person the data represents. On top of all of this, a good percentage of all of the available search results of each and every source of human capital data are never actually found, and most people are completely unaware of this. If you’re looking for people who have the lowest golf scores – you should look for the highly paid professionals. They’re getting paid the most because they get the best results. However, if you’re not keeping score, you might be satisfied with any weekend duffer. If you’re looking to identify and acquire top talent, you should look for professional knowledge workers who understand, appreciate and can fully leverage the latent power of human capital data – they get the best results. However, if you’re happy with just filling positions, you might be satisfied with the results produced by entry and junior level sourcers and recruiters.